This is the sort of thing we’ve grown accustomed to seeing from Chinese street entrepreneurs. 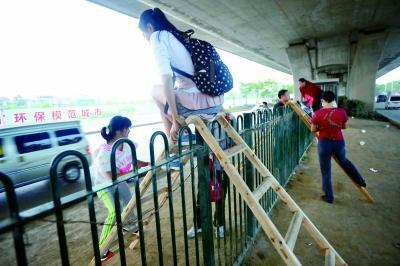 In Wuhan, Hubei province, some peddlers got the bright idea to charge 1 yuan for letting pedestrians use their stepladder to scale a fence that divides the two sides of Huanle Expressway. People are willing to pay, it seems, to avoid detouring a kilometer to cross from the gate of Happy Valley amusement park to the nearest bus station. Hug China has this story via Wuhan Morning Post. The city planners should be blamed, one commenter said, while others shook their heads at this sort of behavior (second-level jaywalking, you could call it). But remember, innovation is a byproduct of inefficiency. We’ve seen plenty of Chinese innovation — for better and for worse. Remember when China was so full of potential and opportunity that local Chinese were going to Harvard, and Yale only to return to China. So much for that. The ‘entrepreneurs’ in this story are essentially homeless, and their only source of income is helping locals break the rules and, you know, risk getting plowed over by… ahem… not the most delicate drivers on Earth. Sad.